Want to flip your class, but unsure how to overcome the inevitable challenges that come with trying something new? We sat down in an exclusive video interview with Jon Bergman and Aaron Sams, the founders of the Flipped Class Movement to ask them how to avoid the most common mistakes when flipping your class. Here’s the Top 5 mistakes to avoid when flipping your class! Want to see how another school has successfully flipped their classroom? Want to flip your class but unsure where to start? We sat down in an exclusive video interview with Jon Bergman and Aaron Sams, the founders of the Flipped Class Movement to ask them for their steps on getting starting flipping your class. Here’s the 4 important things they recommend for anyone to do before flipping your class! But how can you ensure your flip is engaging for your students and works across the higher levels of Bloom’s taxonomy? What is & isn’t flipped learning and why are there so many misconceptions? Got your head around flipped learning and want the data and research on the effectiveness of flipped learning? 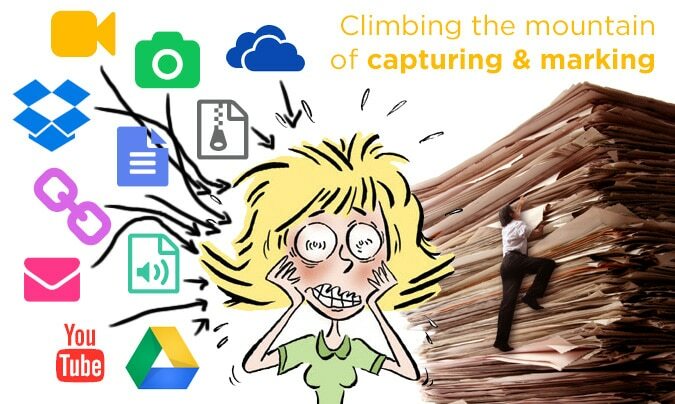 Ever felt like you’re going nuts trying to capture student work and evidence of learning? You want to give them choice, the ability to be creative. To move past pen paper or even their computers to use a range of ways to show off what they have learnt. Some want to use video and photos. Others want to submit presentations, spreadsheets, screenshots, podcasts, physical projects and more! But how do you collect, mark and provide feedback for all of that in an organised way…….? That’s why we’ve released the myEd Capture gadget. We’ve got an exciting solution coming out very soon, stay tuned!